(Nanowerk News) Researchers in Japan have engineered a membrane with advanced features capable of removing harmful greenhouse gases from the atmosphere. Their findings, published in Nature Communications, may one day contribute to lower greenhouse gas emissions and cleaner skies. Greenhouse gases, originating from industrial processes and the burning of fossil fuels, blanket the earth and are the culprits behind current global warming woes. The most abundant among them is carbon dioxide, which made up 84% of the United State's greenhouse gases in 2012, and can linger in Earth's atmosphere for up to thousands of years. Countries all over the world are looking to reduce their carbon dioxide footprint. However, carbon dioxide is essentially a waste product with little immediate commercial value and large treatment costs. Therefore, new low-cost technologies are sorely needed to incentivize greenhouse gas capture by industry. Easan Sivaniah — an associate professor at Kyoto University's Institute for Integrated Cell-Material Sciences (iCeMS) — led an international team of researchers from iCeMS and the University of Cambridge to create an advanced membrane capable of rapidly separating gases. The membrane they worked on, referred to as PIM-1, is "typically embedded with a network of channels and cavities less than 2 nm in diameter that can trap gases of interest once they enter," said Qilei Song, who was involved in the study. "The only problem is that their intrinsic properties make them rather flimsy and their starting selectivity is weak." To overcome PIM-1's weaknesses, Sivaniah's team heated PIM-1 at temperatures ranging from 120 to 450 °C in the presence of oxygen, a process referred to as thermal oxidation. "Oxygen, under high temperatures, chemically reacts with PIM-1 to reinforce the strength of channels while controlling the size of so-called gate openings leading into the cavities, which allows for higher selectivity," said Song. 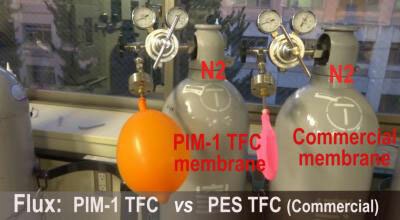 The resulting, improved PIM-1 was found to be twice as selective for carbon dioxide while allowing air to pass through it 100 times faster compared with commercially available polymers. PIM-1 can also be used for other applications such as capturing carbon dioxide from the burning of fossil fuels, enriching the oxygen content in air for efficient combustion engines, hydrogen gas production, and processes to generate plastic. "Basically, we developed a method for making a polymer that can truly contribute to a sustainable environment," said Sivaniah. "And because it is affordable and long-lasting, our polymer could potentially cut the cost of capturing carbon dioxide by as much as 1000 times."